Just wonderful. The childs in the field are making the difference. Me gusta mucho tanto por el momento que has captado como la forma en que has tratado el color. Está muy bien! Preciosa edicion, me gusta mucho las tonalidades que has dado. What a magical..beautiful scene. Love the landscape..and the children running thru the field make it almost fairy-tale-like!! Another lifetime altogether. Fabulous shot. Love the colors. Awesome photo. ara els grocs ja no hi son, però la teva captura si ;-)) per sort!! 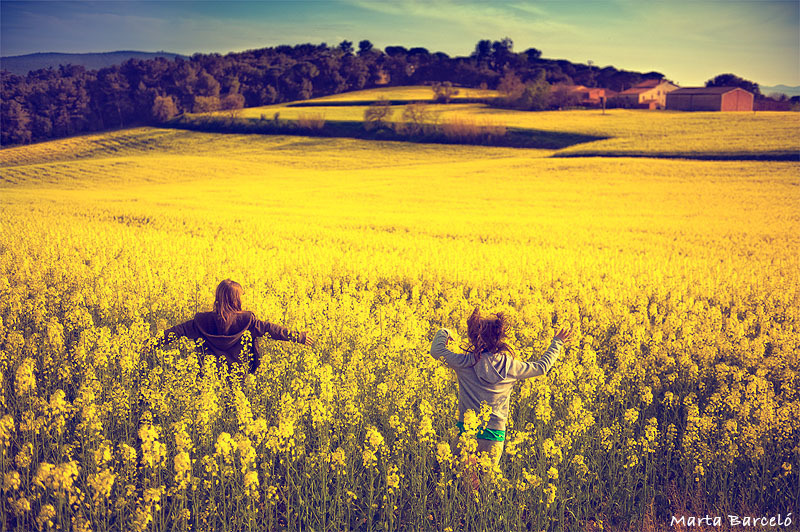 this reminds me of the time when I was playing in the fields when I was little , beautiful shot. Very good, like part of some lost world. a beautiful picture..great lightness, sharpness and colors..bravo! As yellow as possible. I hope the kids did have fun. This is one of those captures that is just "right" in so many ways, the composition, the colors, the mood, the nostalgia. I absolutely love it and am inspired by it. An eye catcher - Loving the toning work.. beautifully framed! tolle Farbgebung und Stimmung im Bild. Schon fleissig geübt mit dem neuen Spielzeug? Amazing colors. I want to go away from city life! Que bien nos tienes acostumbrados a tus imágenes evocadoras y a las emociones de alegría que transmiten. Buen trabajo. What a powerfully nostalgic image. So bautiful... Fantastic vivid colours. It calls back to me attractive memories... :-) Colors are magnificent Marta! Congratulations ! What a fantastic, beautiful shot! Just lovely! superbe traitement , couleurs et contrastes, la joie de vivre ! Very nice! I really like the cross-processing! Incredibly uplifting, wonderful composed and processed and simply dreamy! This harks back to those timeless childhood moments. beautiful shot, love the effects.